Another question I often get asked is “what is vertical gardening?” Quite simply, vertical gardening is growing things upwards rather than outwards. Pretty obvious right? In a clever little twist of cultivation, various simple containers or boxes can be used to grow fruits, vegetables or flowers from the ground upwards. So, other than tending to plants in big dirty flower beds on the ground, you can grow them up against any structure you want. Natural examples of plants grown in a vertical fashion include ivy and other climbing greenery. 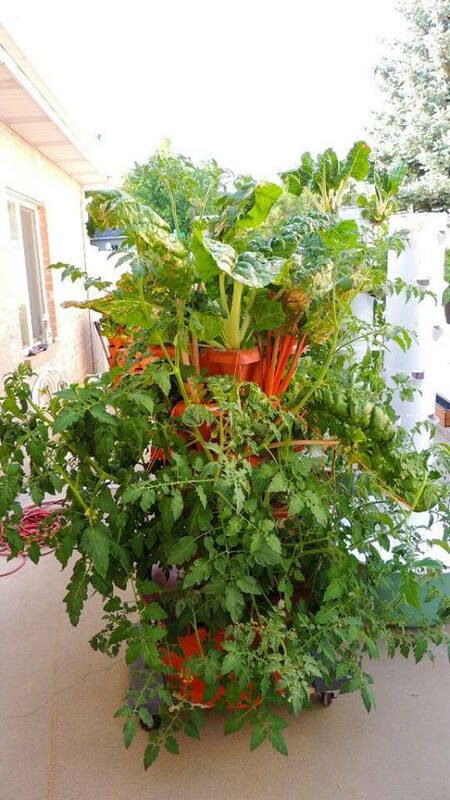 By using a bit of ingenuity, people have adapted this vertical growing to include all kind of flowers, fruits and vegetables. Savvy gardening peeps have figured out literally unlimited ways to upwardly grow whatever you want. Using this idea, you can grow all your plants in almost infinite ways. Planting against a wall, hanging from a beam, stacked in pots or on layers of shelves are all simple solutions. Netting, fences, railings, poles or any kind of garden frame can also be used. This can be done inside or outside of your home. Using multi layers also mean that you get way more crop per area of ground space, making the method extremely popular for urban farming. 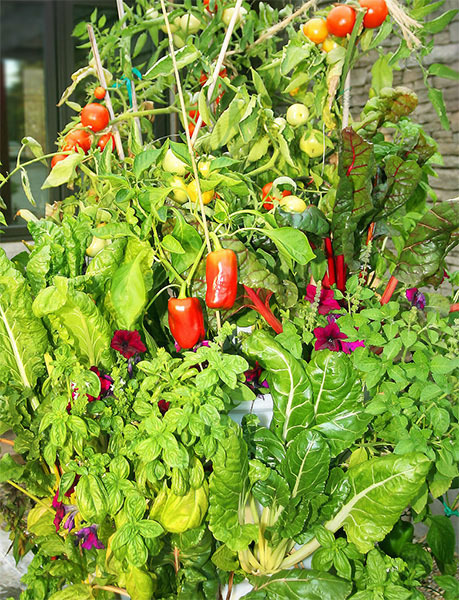 Whether you’re looking to brighten up a garden space, add some colour to a room or even grow some of your own fresh food, vertical gardening will no doubt have an ideal fix for your situation. It really is all the rage and is catching on like a house on fire. 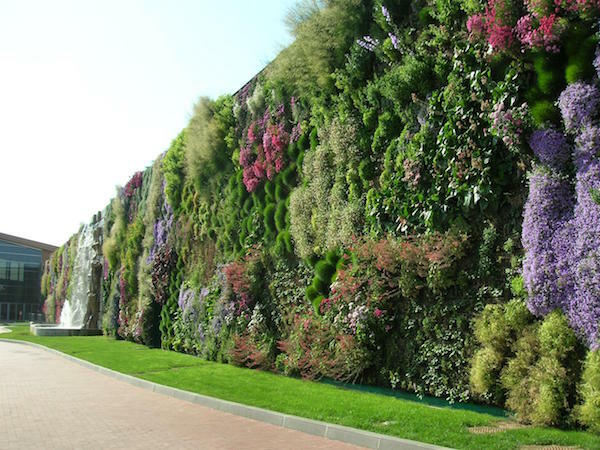 The first suspected deliberate vertical garden was the The Hanging Gardens of Babylon. Such was it’s magnificence, it reached wonder of the world status. This particular structure is said to have used water to feed the plants without using soil. This would’ve also made it a hydroponic garden. Ivy grown up against houses and grape vines are are other more common historical uses. Leaping ahead to today, the idea has been adapted to be used in urban spaces. Mainly because it maximizes the growing capacity of limited spaces. The great advantage of vertical gardening is that a small amount of space can provide a very large amount of flowers, fruits or vegetables. No matter how limited your available area you will be able to grow away to your hearts content. By smartly using vertical space, what may have seemed like an unusable spot is suddenly full of vast potential. Example: Grow 50 plants in 4 square feet of space. Bring alive small areas in your home or garden with colorful flowers or fresh organic food. Ugly walls or fences can be made to look far more attractive when decorated with plants and fruits. It is unlimited. There is an endless array of ways to go about achieving beautiful blooms or ripening fruit and vegetables. The only limitation is your imagination. You can use soil or grow with no soil. Growing with no soil is called hydroponic gardening. You can use anything. Many things lying about your house can be put to work. Bottles, boxes, old ladders, palettes, cloth pockets and almost anything you can think of will work. No more bending down to tend to beds. If you are a little older bending down can be a bit of a task. With this approach, as the plants are raised up, you won’t have to worry. All year growing is possible as you can do it inside. Or even in your basement with the help of some grow lights. Plants can be relocated, if on a movable structure, to take advantage of varying light at different time of the year. Very Low maintenance. Not needing to weed large areas of earth make for incredibly simple care taking of your plants. Less pests and infections. Less soil area means less soils pests. Healthier plants are the result. Bright blooming flowers and high yields of fruits and vegetables can be expected. Therapeutic properties have been attributed to having plants inside your house. 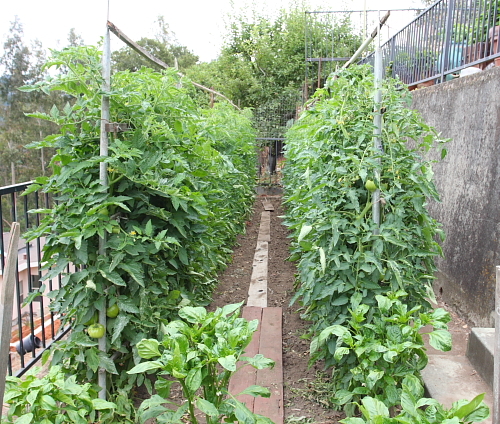 Vines, Peas, Grapes and tomatoes are all good examples of plants that grow upwards if given the chance. With a bit of “training” you can make the shoots grow away from the ground and totally maximise the crop production. By taking the plants up and outwards, not only are the plants better supported they can make a beautiful display. How about this for a great little display. 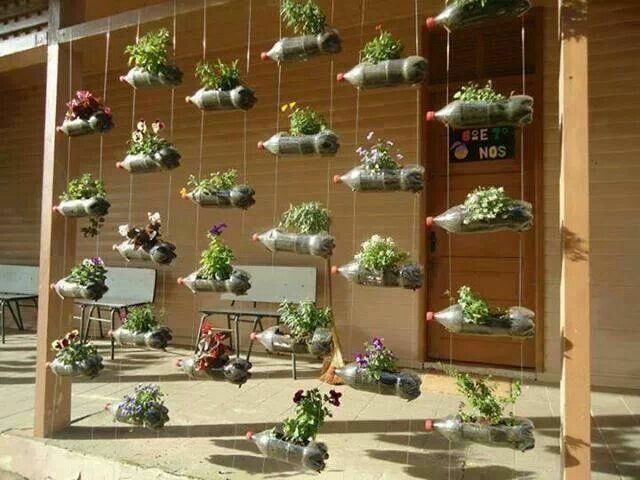 Use old plastic bottles to create a growing space alongside a wall. 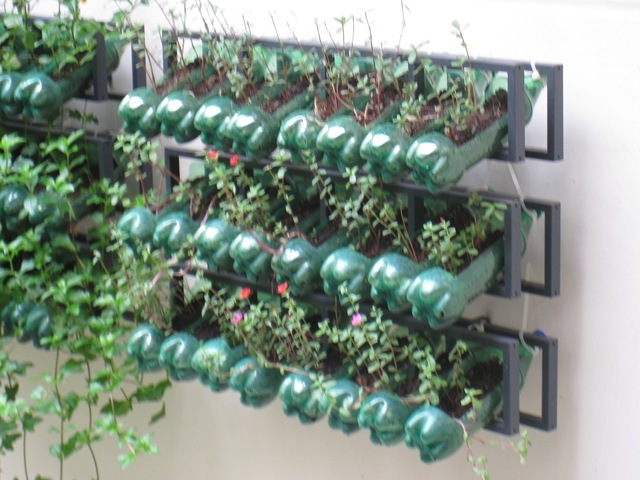 Old gutters can be used, filled with some soil and a highly functional vertical garden is the result. Check out this superb design that allows rain water to flow from level to level. Stacked boxes can provide a great way of growing flowers or food. Maybe you want to free up some lawn space or maybe you just don’t have much space at all. 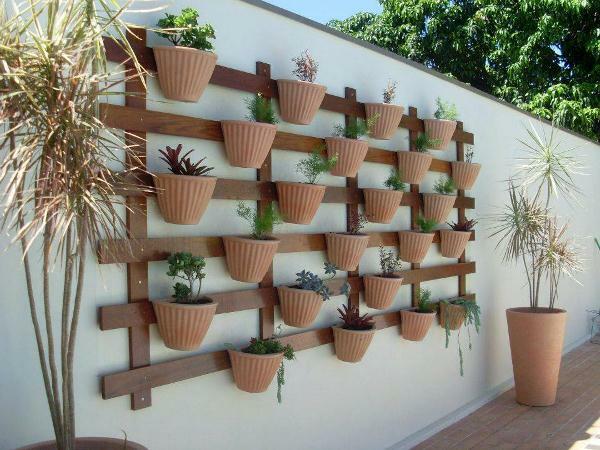 Hanging pots or containers upon a vertical surface is a great way to both decorate and grow veggies, flowers or fruit. It’s very possible to make a cheap and easy suspended flower or herb garden with old plastic bottles, a simple wooden frame and some string. Very simple, very cheap. 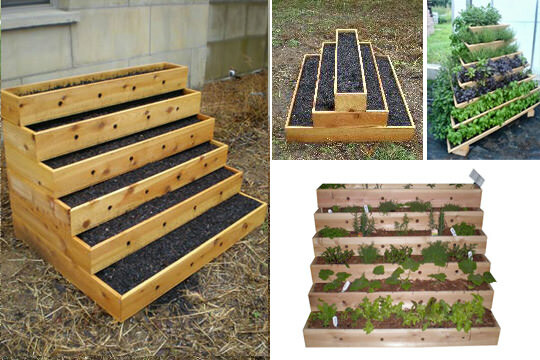 An arrangement of steps is yet another simple solution to limited area gardening. If you’re a bit handy with tools you could easily make something like this yourself. However pre-made items like this can be bough from many garden centers. This contraption allows you to grow twenty plants vertically. It’s a hydroponic system meaning you don’t use soil. What happens is the plants are fed with a special solution and a pump delivers the minerals to the plant roots. More info here. This one’s a bit of a monster. It allows you to grow 50 plants. What makes this one interesting is that it makes it’s own compost. You add your own food scraps to the middle of the tower along with earth worms and hey presto —- you have a compost generating garden. More info here. 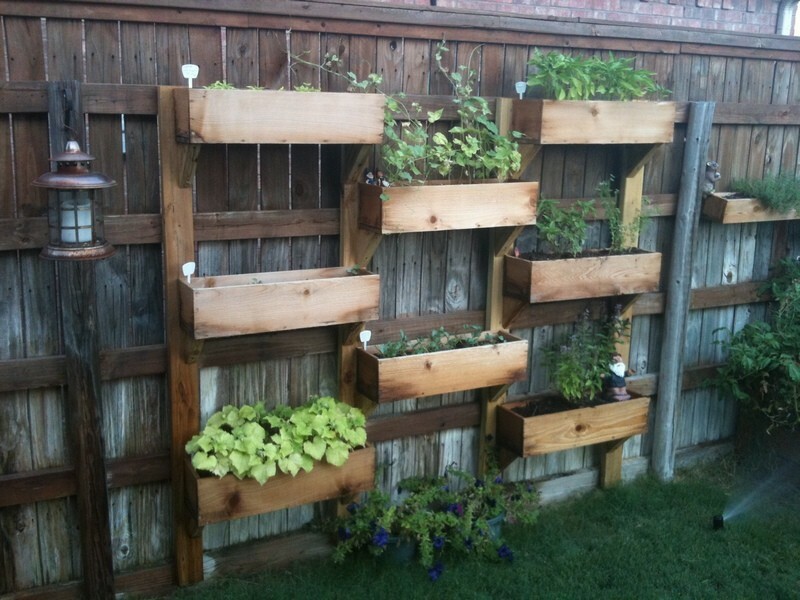 All in all vertical gardening is a great way for people to use a small space to grow their own food. Whether you make a contraption yourself or buy a pre-made system you’ll experience a new way of tending to flowers or food. We hope this answered your question — what is vertical gardening? Any more questions please feel free to ask away in the comments below. Yes, I can see that this would be a great use of space in an urban environment. I have one question, though. You say that you can grow plants without soil. How is that possible? I thought plants need soil to grow, or am I just being naive there? One other thing that comes to mind regarding vertical gardening is that you would need to have a step ladder if you were growing it high up a wall. I wonder if there are any dangers associated with that? Love the concept and see how there is great potential for this form of gardening. I can see also the same way some plants grow higher than others; one would still need to know which plants can be around one another to grow properly with the right amount of light. I should look into this further for when I hope to have more time to do something like this. Thanks for the information and I’ll return. Glad you like the idea (although it’s not mine). 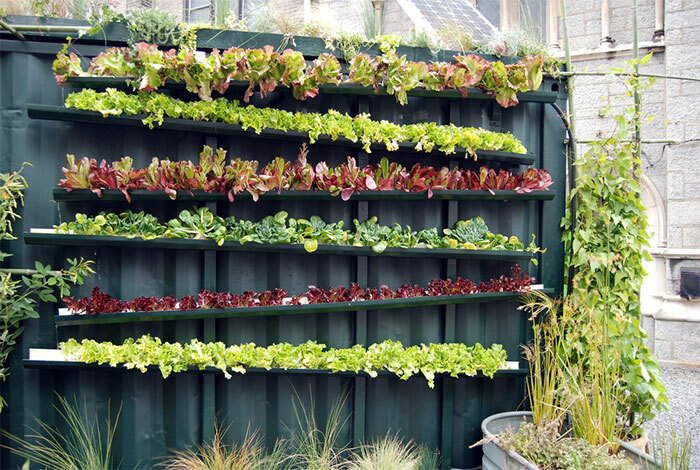 Definitely vertical gardening is a great concept for maximising available space and growing food or flowers at home. Another big benefit as I see it is your food is pesticide free and their is no reason you cannot fresh, healthy food all the time. The design of these garden towers no doubt make this food growing both interesting and something anyone can do if decide to. Thanks Peter, i’m happy you enjoyed the information. Please pop back any time. I think gardening is really taking off, especially with the risks associated with GMOs, and alot of people want to start but may have limited space. Vertical gardening is a great way to grow plants in limited space, or even if you have space they’re still neat. Have you started your own vertical gardens and if so do you have any tips? I’d love to see a review of the GreenStalk vertical planter since it’s kind of between the price of a Mr. Stacky, but not quite in the range of a Garden Tower 2. Have you reviewed that one? Hi Catherine, I’ll look into it. What is The Best Fertilizer For Tomatoes?